Brushing your teeth seems pretty easy, but you may not be getting the benefits of brushing your teeth regularly if it’s not done correctly. Vancouver WA family dentist Dr. Nelson and his staff at Salmon Creek Family Dental are happy to teach you the best way to brush your teeth. There are several brands with different styles of toothbrushes, but how do you know which one is best for you? You receive a complimentary toothbrush for your needs at the end of each teeth cleaning appointment, and this toothbrush should fit comfortably in your hand. Handles differ in size and shape, so choose one that fits comfortably and isn’t too heavy or light. Your toothbrush should also fit comfortably in your mouth. Your mouth and teeth may be bigger or smaller depending upon your frame. Ideally, the toothbrush should be able to reach your teeth at the very back of your mouth to keep them healthy and clean. If in doubt, choose a smaller toothbrush versus a larger one – a dental hygienist at Salmon Creek Family Dental can help you decide. Plaque is difficult to remove, and it may seem like the tougher the bristles, the better they will clean your teeth. However, the toothbrush bristles should be soft or extra soft to avoid harming your gum tissue. These bristles need to to reach inside the spaces between your teeth and gums to remove plaque and bacteria. Hold the brush at a forty-five degree angle instead of perpendicular to your teeth, with the bristles directed at those spaces in order to remove as much plaque and bacteria as possible. The motions you use to brush your teeth should be soft, just like the bristles of the toothbrush. Use short strokes back and forth or in a circular motion to avoid hurting your gums but removing as much plaque as possible. Be sure to brush every surface of each tooth thoroughly, including the top, bottom, outsides and insides of your teeth. Spend time brushing the back of your teeth, cleaning the grooves along the top of each tooth where food can get stuck. 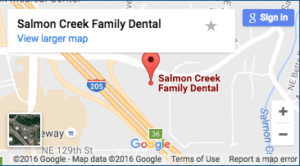 The strategies and products provided by Dr. Nelson and the friendly staff at Salmon Creek Family Dental will ensure that you are cleaning your teeth well each time you brush!